A wood carving of the MSBOA seal was created by Emeritus Member Ken Bowman. Ken converted the two dimensional image, used in MSBOA publications and on awards, to a three dimensional plaque. Along with music symbols the plaque features a map of Michigan and the state coat of arms. Each letter and individual figure was hand created and placed on the base. The work was begun in June of 2000 and presented to the membership in January of 2002. Our mission is to provide each student intellectual and creative instrumental music experiences expressed through emotional and artistic communication. The fine arts should be a vital part of the educational process. In a civilization stressing scientific achievement, material wealth and specialization, the fine arts contribute greatly toward the maintenance of a proper cultural balance. As one of the areas of the fine arts, instrumental music also has as its primary purpose the improvement of the quality of life of the individual. This is accomplished by helping students acquire the skills of musical communication, thereby providing yet another means of sharing ideas with others. For many students, music is the most feasible and enjoyable means of communication available to them. As an expressive art, instrumental music requires growth in physical, intellectual, emotional and aesthetic areas. 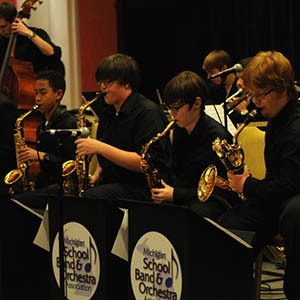 MSBOA’s primary purpose is to advance quality music education through the study and performance of instrumental music. The many types of festivals we sponsor are a means to that end. The rules and policies governing these festivals are devised to ensure that the same standards are applied to each group or individual participating. Adherence to these rules and policies is the sole responsibility of the director. MSBOA considers it unethical for a director to attempt to circumvent the letter or the intent of these rules in any way. MSBOA’s reputation and effectiveness depend on its member’s willingness to exemplify the spirit of these rules and a sense of fair play. Each director’s willingness to take responsibility for his or her own actions gives all students the role model they deserve. On February 3, 1934 the Southeastern Michigan Band and Orchestra Association was formed. This single district organization gained the attention of other areas of the state. It was through the efforts of Dale C. Harris of Pontiac and Mac E. Carr of River Rouge that MSBOA was founded. Eugene F. Heeter of Holland was delegated to serve as President pro-tem to facilitate the organizing of the state-wide organization in 1935. He met with newly appointed University of Michigan Band Director William D. Revelli who assisted in the formulation of the association. The individual directors in the state were dissatisfied with the actions of the State Director of Music Education and in particular his decision to end contests in the state. On February 8, 1936 the ratification of the MSBOA constitution at the Olds Hotel in Lansing saw the beginnings of the statewide association. Heeter was elected the first President of MSBOA. Once MSBOA was officially formed, a state-wide Solo and Ensemble Festival was planned for May of 1936. The association also scheduled clinics and workshops for teachers and an all-state band was formed for students. In 1938 the first state-wide Band and Orchestra Festival took place. The format was similar to what is in effect today, with the exception that sight-reading was optional. Due largely to the success of the festivals and workshops, MSBOA had grown to solid structure and respect by 1938. MSBOA had assumed the leadership role in instrumental music affairs in the state of Michigan.